Ooey, Gooey and Gluten-Free: Brownies, Baby! On certain very special Saturday mornings when I was growing up, a sweet aroma would tickle my nose, gently nudging me out of bed and into the kitchen. It was the smell of freshly baked brownies, cooling on the stove top in their 8 by 8 tin pan. It was my number one favorite treat when I was growing up–dense, fudgy (never cakey!) squares that fell apart in your napkin when you scooped ’em out of the hot pan. My mom always made the standard recipe out of the red checkered Homes and Gardens cookbook, never using a packaged mix or fancy toppings. The beauty was in the simplicity of these unadorned and positively addictive chocolate treats. They never lasted long around our house, although I do remember peeling back saran wrap and gnawing on cold brownie bits from the freezer. Yu-umm. My first attempts to adapt that treasured recipe failed. There was something not quite right about my sugar-free concoctions. I tried tweaking the Homes and Gardens recipe by replacing the flour with various flour blends, and the sugar with erythritol. I would end up with shapeless goo or dry, flat blocks that were light and airy–decidedly unbrownie like. The standard low carb brownie recipes made out of various combinations of almond meal, flax meal, and cream cheese always lacked a characteristic “heaviness” of the stick-to-your-ribs treats of my childhood. Enter the hero of our story, coconut flour. If you haven’t heard of it, listen closely, because what I’m about to say will change your life. It’s just coconut meat with the fat pressed out, pulverized into a fine powder. Though it may look like all purpose flour (cue ominous music), this magical substance is so fragrant and alive compared to its refined evil twin. Get it here, or pay twice as much at your local health food store. I always have to stick my nose in the bag and inhale before baking with coconut flour. Now coconut flour can be tricky to work with, so you must follow a tried and true recipe, or be stuck with a pan full of door stops. The moisture-sucking quality of coconut flour must be tamed with copious amounts of eggs. Once you get the hang of it, you will be turning out moist muffins and fudgy brownies that put my Mom’s old recipe to shame. Blasphemy, I know! These are ah-mazing. The center of the brownie pan is almost molten chocolate. I like to eat this part first, with a spoon. The edge pieces are firm, but moist. These brownies are a hit of pure chocolate to the brain–not the least bit coconut-ty, if you’re worried about that. They’re perfectly sweet with a subtle hint of caramel flavor from the molasses. They’re so incredibly rich that one serving should be enough, with all of the healthful natural saturated fat these brownies contain. Make a small pan if you are feeling emotional, ladies. UPDATE, 5.2.09: This recipe for coconut flour brownies is MUCH more reliable, and even more delicious! « Homemade Low Carb Gluten-free Wraps: You can do it too! 38 Comments on Ooey, Gooey and Gluten-Free: Brownies, Baby! do you use 1/2 c sweetener PLUS your natural sweeteners below? Is each line an option or do all three below your natural sweetener option combine? Oh my goodness. I am making these tonight. This is the #1 thing I’ve missed since LC’ing, and I have everything on hand except the coconut flour, which I am at this very moment fleeing my house to procure. Anonymous – Thanks for your great question! I tried to make the instructions a bit more clear in the blog post. You use ALL THREE of the listed sweeteners. I put “1/2 cup of sweetener” because the original recipe used sugar, so if anyone wants to use sugar or another sugar substitute, that would also work. Can you think of a reason why you just can’t grind desiccated coconut into flour? I realize the coconut flour has been defatted but wouldn’t grinding your own solve the sponge-sucking problem that the flour has? they think of everything don’t they! Zedgirl – Someone made these with ground coconut flakes, and she was pleased with the outcome. Coconut flour is so finely milled and dry. The courser grind of dessicated coconut along with the flavor of the coconut oil would affect the flavor and texture I’m imagine. These…were absolutely delicious! So far, I have followed your recipes for brownies, pizza crust, “English” muffins, ice cream, ice cream bars, and “PayDay” peanut treats — and they have all been rousing successes. I can’t wait to get some coconut flour and try these! Also, thanks for posting the link to the Emerald Forest site. I ordered both sweeteners and they got here SO FAST! Thumbs up! I made these tonight and they were delish. I’ve made the coconut flour recipe from the TIANA site before, but this was yummier (loved the gooey-ness). We had them w/ vanilla/stevia sweetened ice cream tonight (have been adding a touch of xanthan gum to our ice cream. OMG does it make it creamy. It totally takes the texture to another level! Gwuinifer – So glad you enjoyed the brownies! Your description of the texture is dead on–it’s molten chocolate cake-ish. Thanks for the kind words! outis – I laughed out loud at your comment! Hope you didn’t slap yourself too hard, LOL. Hooray for ketosis after brownies! Beth – Your ice cream sounds wonderful! I have been making my ice cream with stevia and xanthan gum as well. Tastes better and richer than any sugary ice cream I remember! Care to share your recipe? Hey Lauren! These brownies are awesome!! Good work once again. The bit of molasses really adds some nice flavor and sweetness. I didn’t want to deal with the foil lining so I put them in silicone baking cups (as I do with a lot of recipes). I ate them all in one evening!!! My hubby (the worst critic) even liked them. I’ve also made your english muffin recipe and the ice cream bars (as you already know from my blog). Fabulous! Lauren! I just found your blog and made these brownies and they are kicka**! Thank you…I hope you find time to keep experimenting and posting while going to school, because I’m sure in the market for gluten-free, low carb, non-AS natural foods! Way to go! Have you ever tried using almond flour in these? Mommy Kong – So glad you’re enjoying the recipes! The silicone baking cups are a great idea for these. Thanks for sharing that tip! Anonymous – The almond flour wouldn’t work in this specific recipe, but I do have a brownie recipe using almond flour that I’ll get around to posting at some point! Great question. Help! I made these, but they turned out more like a light brown chocolate cake. (good cake, but I was trying for brownies!). I measured 1/4 cup + 2 tbs of coconut flour AFTER sifting. Was that my mistake? Hey Laura, I just made some of these brownies tonight (I’ve made several batches already since you posted this) but I over cooked them a bit and as I was cutting them into slices, I was thinking that these overcooked brownies could easily be transformed into chocolate biscottis. I mention this to you cuz I know you’d go crazy with the variations and do it much better than I ever could. 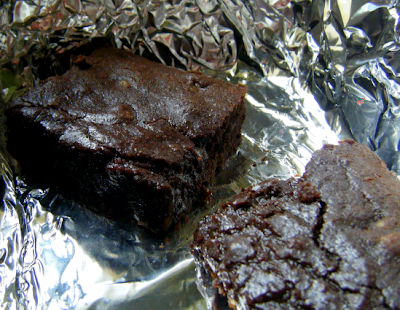 Making chocolate biscotti sounds like a great way to recycle a batch of these brownies, Mommy Kong. I’d slice the brownies into 1/2″ thick slices and bake at 325 degrees for 20 minutes or so, flipping over once. Am working on a less finicky coconut flour recipe to be posted soon. Sorry about the weird baking time! Thanks for sharing your experience with these. Hi I'm trying to find the ooey gooey brownie recipe can someone give me the link please? All I can see is the picture, Lauren's description and comments. Make it at your own risk! 🙂 My new brownie recipe is much more reliable, and just as delicious! It is linked from this blog post. Great article as for me. It would be great to read something more concerning this topic. Can someone point me to the original "gooey" recipe? The "revisited" recipe is a little dry for my taste. Anon, the original recipe was very hit or miss. One minute of cooking time longer or shorter than the perfect time, and they'd be either dry and not gooey at all, or totally wet. Still engineering that perfect recipe. 🙂 Stayed tuned! I tried to veganize this recipe. I used 1/2 a cup of Steviva Blend, even though it's 2:1 in sweetness. I had to use it as 1:1 because the batter just didn't taste sweet enough to me. I couldn't do the water bath because my pyrex dish wasn't big enough for the pan, so I baked it for 10 minutes and added 1/4 cup of water to compensate for the moisture-sucking effect of coconut flour and chia. Definitely a wise move. I will say that the chia seeds I used as an egg sub messed it up the whole thing. It was gooey but the gelling of the chia seed gave it an odd gummy texture. I would've tried the "updated" version but I don't do soy anymore so that's not an option. I think yacon syrup would've done nicely here. Maybe I should experiment with applesauce as well. Mark, the recipe was quite temperamental so I took it down. A new brownie recipe is in the works! It all comes down to why I think I have to finish it. If there’s something keeping me going that’s not an external pressure I’ll usually try to finish it. Otherwise, no way, bye bye. Where can i find this recipe? All the links arent working.